29 exercises in aural awareness by Harry Pickens. Concise and very usable. Small booklet that’s easy to carry with you! Solfege has become one of the most highly acclaimed resources for the study of ear training in music education today. This revised and expanded third edition includes a multitude of new musical examples and dictations covering the entire continuum of musical developent from classical to modern. For the first time, Solfege also includes definitive audio performances on CD of each of the 51 musical dictations, keyed by track number to the musical notation in the text. As students progress from the simple to the complex by following these carefully interrelated lessons, the results are, according to Mel Powell, akin to…. (BH Kodaly). All of the musical examples in Sound Thinking: Music for Sight-Singing and Ear Training are drawn from folk songs and art music encompassing a wide range of historical eras. The examples can be used for developing a variety of skills including sight-reading, dictation, musical memory, rhythmic reading, formal analysis, part singing, and improvisation. A complete, progressive course that teaches musicians how to notate music from audio examples, packaged separately on a 3-CD set(0131872397). Basic melodic dictation is followed by progressively more complex scores, in classical, jazz, and popular styles. 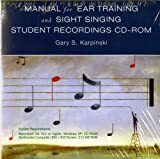 This disc, which accompanies every copy of the Manual for Ear Training and Sight Singing, contains more than 680 recordings on real instruments of dictation, transcription, and other listening materials. The students’ instructions for these materials appear at the end of each chapter in the Manual for Ear Training and Sight Singing, and all answers are printed in the Instructor’s Dictation Manual. The recordings appear on the disc in MP3 format, allowing students and instructors to use them in multiple settings. In this book you will discover: Transcribing techniques. How to maximize your creativity and productivity. How to develop your craft by consolidating techniques. How to read music with your ears. How you can write music without using an instrument. How to write music spontaneously, as your ear guides your hand. How to communicate accurately through music notation. Why you don’t need “perfect pitch.” Tools to develop your music perception. 140 exercises, many music examples—models for a lifetime of study. Resources for composing, orchestrating, film scoring. Working in the music business. Where to find supplies, organizations, information, inspiration. A definitive guide…. The Green Violin; Theory, Ear Training, and Musicianship for Violinists is designed to provide classical and improvising violinists with the foundational theory, ear training, and musicianship basics that they need to study and play the violin. The Green Violin introduces music theory, ear training and musicianship as they apply to the practice of scales, bowings, and to listening assignments specifically designed for violinists. The Green Violin is structured in four sections that can be tackled concurrently: Chapter 1: The TERRAIN lays out the music theory that all violinists must be familiar with. Chapter 2: The DRILL introduces the Major…. (Instructional). This method is a truly entertaining approach to learning how to play the piano. Written by Ward Cannel of the Piano Consortium, the method breaks down music theory into visual concepts which are fun and easy to grasp, so you can learn to play the music you want to play! Perfect for those piano lesson dropouts!